Hakea macraeana, the Willow Needlewood, is a rounded plant that will develop into a tall shrub or small tree reaching a height of four metres. Growth habit is graceful and willowy. Leaves are bright green, terete (circular cross-section) and tipped with a sharp point. Flowers are white, carried in racemes and cover the branches during the flowering period that extends from August to October. Woody, persistent, egg-shaped fruits, covered in warty lumps, follow the flowers. Each fruit holds two winged seeds. Both growth habit and flowers are attractive features. 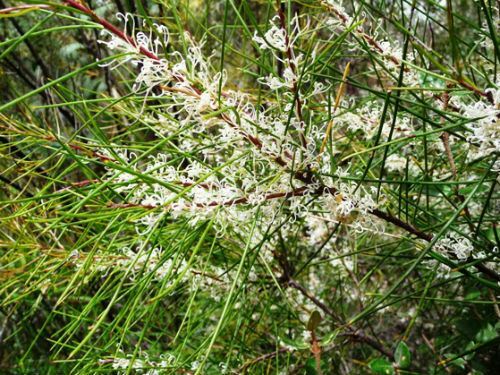 Hakea macraeana is found on the south coast, southern tablelands of New South Wales and northern Victoria. Hakea macraeana and Hakea ochroptera are similar species. The latter species was once included in Hakea macreana. Botanically there are some differences. Hakea macraeana seeds have dark grey wings whilst H. ochroptera has seeds with pale wings. There are also differences in the hairiness of the flower’s perianth. Although botanically there are these differences we feel that horticulturally both species are identical. Visually they have the same growth habit, foliage, flowers and fruit. Both species could be cultivated as attractive stand alone specimens or hedge plants. Hakea ochroptera occurs in northern NSW, near Dorrigo. Propagate both species from seed and possibly cuttings.